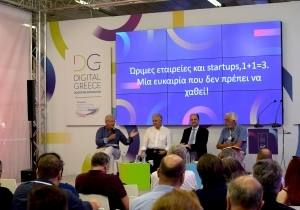 During the 83rd TIF – which emphasized innovation and technology - OK!Thess participated as an important initiative by the City of Thessaloniki, representing the startup community and the overall effort to promote synchronous entrepreneurship. In particular, its presence at Digital Greece's 12 Pavillion - which hosted all startups as well as all the organizations involved to the specific ecosystem - was with a double booth in which there were photos of the events that the incubator hosts, a display screen with the continuous viewing of the events and workshops of the incubator, printed materials as well as stickers and key rings to the visitors of the booth. Mr.Simon Bensasson - head of OK!Thess - exchanging views on the need of co-operation between startups and mature businesses. The program of OK!Thess at the TIF and its various actions was hosted by the media - radio and TV channels TV100, ET3, ATLAS TV, Athens News Agency, SKAI - posts and references on the Facebook page and on the official site, but also on the electronic press with the publication of texts and press releases, concerning either OK!Thess or its startups, such as Voria.gr, Athens News Agency, ka-business.gr etc. Important institutions of the local innovation community of the city supported the presence of OK!Thess in the TIF - such as the Aristotle University of Thessaloniki, University of Macedonia, Alexander Innovation Zone S.A., the Federation of Industries of Northen Greece, SEPVE, SEVE, and KEPA - either by promoting the program in their channels of communication or by participating in panels, that representatives of OK!Thess were speakers, or even by visiting the booth and the startups.